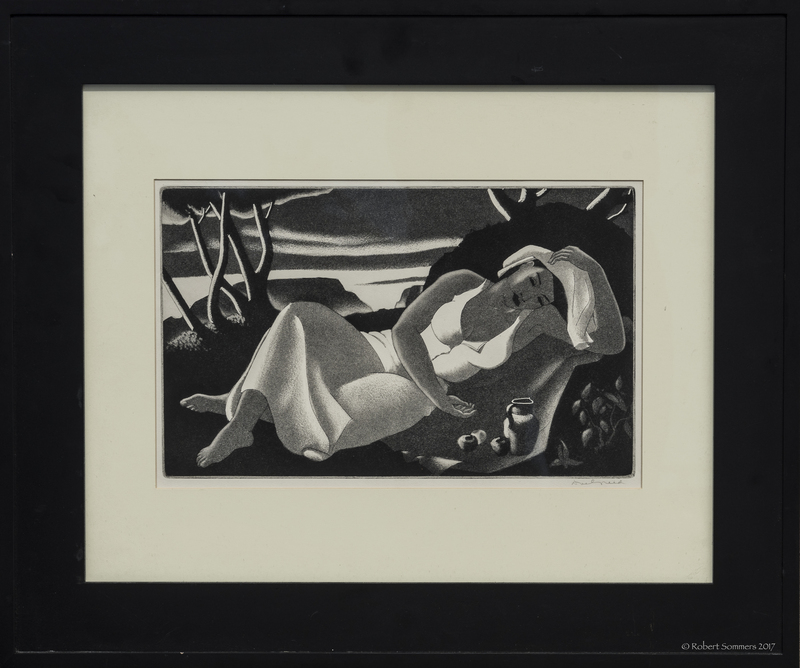 Doel Reed (1894-1985) Rest Aquatint AAA ed. of 100, 1941 8 15/16 x 14 7/8″,framed, pencil signed lower right. Doel Reed was born in Fulton County, Indiana. He later credited visits to the Indianapolis Museum as a powerful force in the development of his early interest in the arts. After a brief study in the field of architecture, Reed entered the Cincinnati Art Academy. He served in France during World War I, after which he resumed his studies at the Academy. His first interest was printmaking which was inspired by watching L.H. Meaken print from the etched plates of Frank Duveneck. Later he would become an undisputed master of the aquatint. He would also become recognized nationally as a painter. Doel Reed had a long association with the Southwest, which spanned nearly sixty years. He served as Professor and Chairman of the art department at Oklahoma State University for thirty-five years. He retired as Professor Emeritus in 1959 and moved to Taos the same year. Long before he had been visiting New Mexico summers and vacations.